Texas Hold'em is by far the most popular poker game, both live and offline. There are basically three versions of the game: No Limit Hold'em, Fixed Limit Hold'em, and Pot Limit Hold'em. Each form of the game has the same basic rules; only the betting structures are different. This article will explain Texas Hold'em as a general game, and then explain the differences between each betting structure. Texas Hold'em is a poker game where players bet money in hopes of winning the collective pot. There are two ways that a player can win the pot: either by making a bet to which everyone folds, or by showing down the best hand. The first situation would occur if you made a bet, and every other player decided they didn't want to call. You'd be the only player left in the hand, and thus would win the pot. In the second situation, the hand would go all the way to the river, and whoever has the best hand wins. Since hands are dealt randomly, every player has an equal chance of winning a random hand at showdown. However, winning players increase their odds by playing with proper Texas Hold'em strategy. By folding when you have a bad hand, and betting more when you have a good hand, you can increase your long term win rate. After you learn how to play Hold'em, make sure to read our No Limit Hold'em poker strategy to get some great tips for winning more money. The rules of Texas Hold'em are fairly simple, and once you play a few hands you'll have the hang of things. Keep reading to learn all the rules of the game. The game starts with two players making forced bets called "blinds". There are two blinds - the small blind and the big blind. The small blind is equal to one small bet, and is paid by the player directly to the left of the dealer. The big blind is equal to one big bet, and is paid by the player directly to the left of the small blind, which would be two seats to the left of the dealer. After the blinds are posted, each player at the table will receive two face down cards. The cards are dealt out one at a time, and start with the small blind and progress clockwise around the table until each player has two cards. After everyone has their two cards the first betting round begins. Now that everyone has cards the first betting round will begin. The player to the left of the big blind is the first to act, and can either call, fold, or raise. A call would require that player putting an amount of money into the pot equal to the big blind. A raise would require that player putting an amount of money into the pot equal to at least 2x the big blind. After the first player acts, betting continues around the table clockwise. Each player can either call the previous bet, fold, or raise the previous bet. Whenever someone raises they have to make it at least 2x the size of the previous raise. For example, if a player made a $6 raise, the next raise would have to be to at least $12. The big blind is in a unique position, because if the pot is never raised he/she has the option to check meaning that he/she wouldn't put any money in the pot, and the betting round would end. The first betting round ends once every player has folded or called the highest bet. After that, you deal out the flop. After the first betting round, you'll deal out the first round of community cards, called the Flop. The dealer should first "burn" the top card, meaning that he/she would place that top card to the side face down. Then, deal out the next three cards face up in the middle of the table. These three cards are community cards, and can be used by any player in combination with his/her hole cards to make the best possible five card poker hand. After the flop is dealt out, there is another betting round. This round begins with the small blind, and progresses around the table clockwise. Each player has the option to bet (if no one has bet), check (if no one has bet yet), raise (if there has been a previous bet), or fold (if there has been a previous bet). The betting round ends when every player has folded or called the largest bet. After the flop betting is completed, the dealer will burn another card, then place the next card face up in the middle of the table. This will make a total of four community cards that can be used by each player to make the best possible poker hand. Now there's another betting round that is exactly the same as the flop betting round: starting with the small blind (or the first person to the left of the dealer who is still in the hand), move clockwise around the table. After the betting on the turn is over the dealer will burn one card, then place a final card face up in the middle of the table. Now there are a total of five community cards that each player can use. Once again, there is a betting round starting with the player directly to the left of the dealer. If more than one player stays in for this betting round, there is a	showdown to determine who wins the pot. In the event of a tie, the winner is determined by how high his/her hand is. For example, if two players have straights, the higher straight will win the hand. Like I mentioned before, Texas Hold'em is usually played in either No Limit, Fixed Limit, or Pot Limit forms. No Limit means that you can bet any amount you want at any time, as long as the bet is at least the size of the big bet for the table, or at least twice the size of any previous raise. Pot Limit is exactly the same, except the maximum bet you can make at any time is equal to the current size of the pot. Fixed Limit means that the betting structure is fixed, and there are small bets and big bets. The small bet is the size of the table's big blind, and the big bet is twice the size of the table's big blind. If you play at a $1/$2 Fixed Limit table, the big bet would be $2, the small bet would be $1, the big blind would be $1, and the small blind would be $0.50. Before the flop and on the flop, players can only bet increments of the small bet. So, for example, if you were at the $1/$2 table, you could only make preflop raises in $1 increments, and flop bets/raises in $1 increments. However, on the turn and river you use the big bet. So in this case you could bet in increments of $2 on the turn and the river. Royal Hold'em is played exactly the same as normal Texas Hold'em, but the deck only contains 10's, Jacks, Queens, Kings, and Aces. Pineapple is the same as Texas Hold'em, but each player gets three hole cards at the start of the hand, and has to discard one of them later in the hand. All players get the same number of hole cards, but there are two sets of community cards. The winner is chosen for each board with each winner getting half the pot, or if one hand is best for both boards that player can get the whole pot. Players get two cards from a smaller deck, which contains no cards lower than a seven. A five card board is dealt one card at a time, with a betting round happening after each card is dealt. Texas Hold'em is the most common poker game played in tournaments, such as the World Series of Poker. In a tournament, chips are used in place of money as a player's bet. All players pay a fixed buy-in and start with the same number of chips. The game continues until one player ends up with all the chips in play. The majority of players in a tournament usually get little or no money, but the top finishers receive many times their buy-in. In these tournaments, blinds and antes will increase on a regular basis and can become much bigger towards the end of the tournament. Play in tournaments is usually much more aggressive, because of the ever increasing blinds. Mathematics and strategy play an important part in whether a player wins or loses in the long run. Learn more about No Limit Hold'em Tournament Strategy. Once you learn the basics, now its time to try out your luck online. 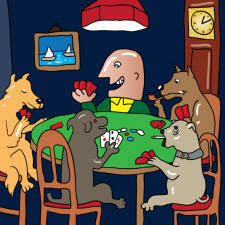 Our top rated Hold'em site is Full Tilt Poker, so read more to see if they are the site for you. Or, check out all of the online Texas Hold'em Sites.